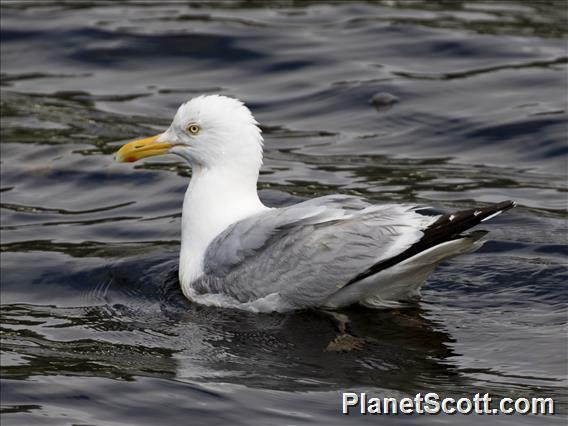 A large (23-26 inches) seagull, the Herring Gull is most easily identified by its black-tipped wings, pale yellow eye, pink legs, and yellow bill with red spot on the lower half. Winter and immature gulls of many species are notoriously difficult to identify as these birds may be splotched or streaked with brown on the head and breast. Male and female Herring Gulls are similar to one another in all seasons. The Herring Gull inhabits a wide portion of the Northern Hemisphere. In North America, this species breeds across Alaska, Canada, the Northern United States, and the Mid-Atlantic region. Populations breeding in southern Alaska, the Great Lakes, and the Mid-Atlantic region are non-migratory, while those breeding in the interior migrate south to the Pacific coast from southern Alaska south to central Mexico, along the coast and in the interior in the southeastern U.S., in eastern Mexico, in Central America, and in the West Indies. In Eurasia, the Herring Gull breeds in northern Europe and Asia, wintering south to North Africa and South Asia. Herring Gulls breed on rocky or sandy islands and beaches by lakes, in marshes, and along the coast. Similar habitats are utilized in winter as in summer. Herring Gulls eat a variety of foods, including crustaceans, fish, carrion, garbage, and, occasionally, other birds. Herring Gulls are most easily seen foraging for food along sandy beaches. In many areas, this is one of the most common “seagulls,” and may be seen foraging for refuse and carrion on the beach, flying over the water and plunging in to catch fish, or floating on the water’s surface while catching fish with its bill. This species is primarily active during the day. Bibliographic Citation: Rumelt, Reid B. Larus argentatus. June-July 2012. Brief natural history summary of Larus argentatus. Smithsonian's National Museum of Natural History, Washington, D.C.
Not 100% sure. Large adult gull with smudgy head and pink legs.